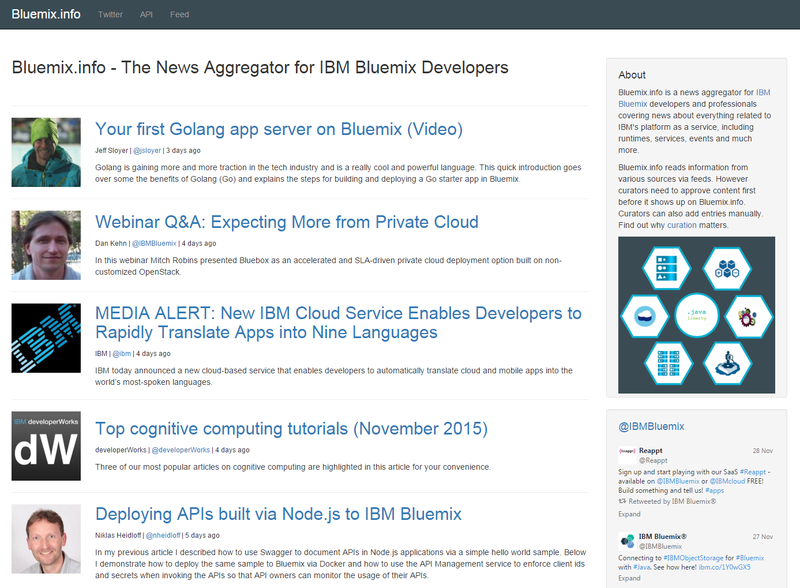 One year ago I launched Bluemix.info, a news aggregator for Bluemix developers. Over the last year I’ve published 1004 links to Bluemix related articles written by 279 people. Many Bluemix developers read Bluemix.info frequently, I’ve received a lot of positive feedback and the Bluemix feed was integrated in the official Bluemix blog site. Since yesterday however Bluemix.info is not online anymore. There are multiple reasons for it. One reason is that there are other ways now to find Bluemix news. I created Bluemix.info because at that time it was hard to find all Bluemix related news published on different sites. Fortunately the Bluemix Twitter stream has become a really good tool to find Bluemix news. I also built the news aggregator application to learn more about Bluemix. The application is still available as open source and I documented some of the key techniques.